Former Belorussian (Byelorussian) Soviet Socialist Republic, independence in 1991. 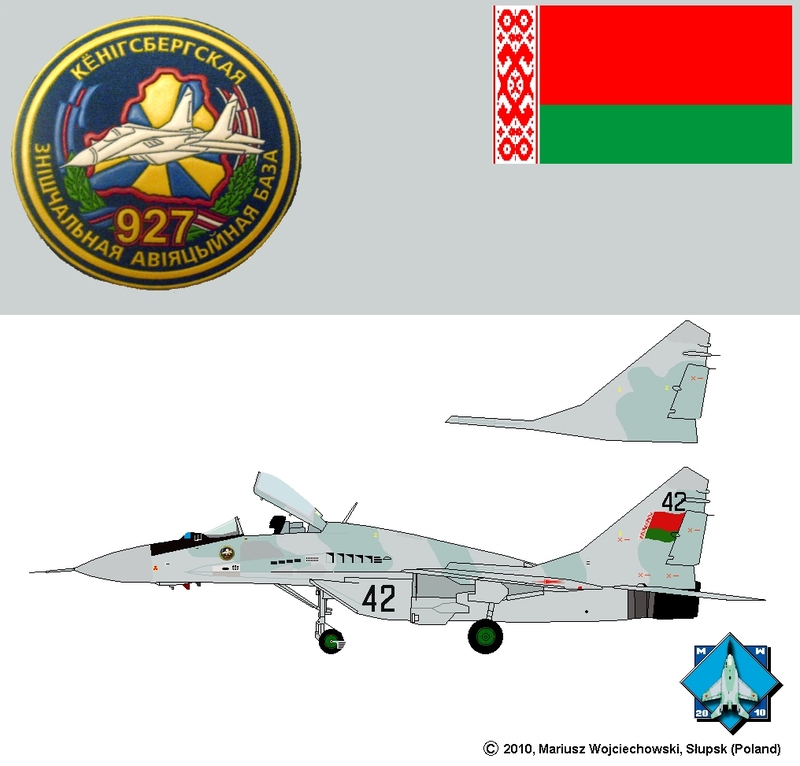 Belarus inherited MiG-29 and Su-27 in 1991 when USSR splits: MiGs in Бяроза-Kартуская (Byaroza), Sukhois in Баранавiчы (Baranovichi) and MiGs of the withdrawed 11th May 1993 from Finow (Eberswalde) in East Germany 787th Fighter Air Regiment, which was moved to Belarusian airbase Ross, later to Baranovichi. MiGs were then dislocated: 52 in Byaroza 927th Air Base and 30 in Baranovichi 61st Air Base. 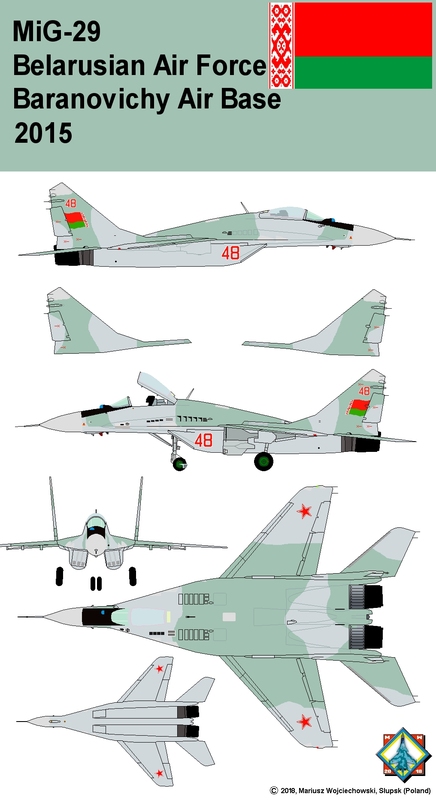 - 1999-2002: 32 MiGs from Byaroza were sold to Algeria. An amount of MiGs in Belarus decreased then from 82 to 32. April 2010: two MiGs from 927th Air Base in Byaroza collided in mid-air. Aleksey Tiborovsky ejected, Major Sergei Mikhailov's MiG landed safely. MiG-29UB no 63 crashed. 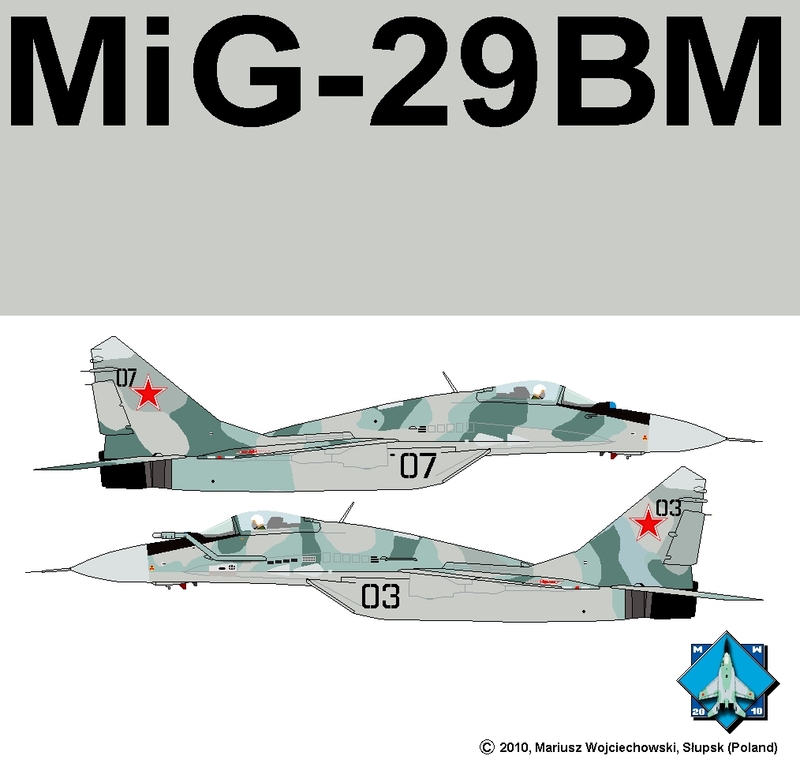 November 2014: MiG-29 no. 18 crashed. An amount of MiGs in Belarus decreased then from 82 to less than 30. 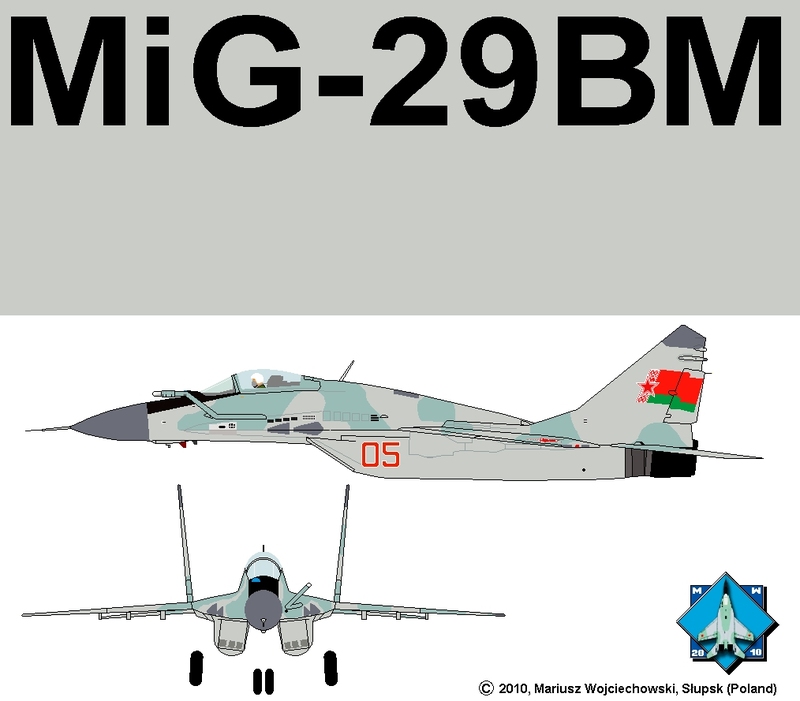 2003-2005: modernization to MiG-29BM standard (expected 7 or 9 aircraft 9.13). Belarusian MiG-29 (and Su-27) were overhauled, also modernized between 2003 and 2005. 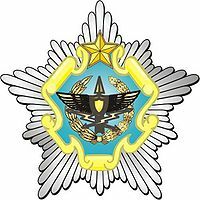 In 2003 Belarusian РУВП 558-ы авіяцыйны рамонтны завод (558th Air Repair Plant) in Баранавічы (Baranovichi) start a modernization, in cooperation with a Russian enterprises ОКБ "Русская авионика" (Russian Avionics). Between years 1996 and 2003 all Russian modernization project failed: MiG-29SMT (9-17, 8-18, 9-19), Su-27UBM (project T10UM, upgrade of Su-27UB to multirole fighter), Su-30KN (project T10PM2, upgrade of Su-27UB and Su-30 to multirole fighter), developed by Mikoyan Bureau and Irkutsk IAPO. Only a Komsomolsk-on-Amur KnAAPO realised a Su-27SM (project T10SM, upgrade of Su-27S/P to multirole fighter). Then "Russian Avionics" join efforts with Baranovichi plant and quickly developed MiG-29BM in 2003 (and Su-27UBM-1 in 2004). MiG-29BM it's a standard similar to MiG-29SMT 9.17, with precision bombs and air-surface rockets (R-27ER, R-27ET, Kh-29T (TD), Kh-29L, Kh-25ML, Kh-31A, KAB-500Kr and KAB-500L), improved navigation system and MFI-55 display in cockpit. Important: fixed in-flight refueling probe is installed (refueling from Su-24M with UPAZ refueling pod); a probe is easy detachable, as we can seen now (2009-2010). First was aircraft #05 modernized in 2003, then next three, maybe more. First public appearance of the four aircraft at MILEX-2004 in Summer 2004. In 2005 MiG-29BM established some spectacular world records. MiG-29BM, Belarus, 558th Air Repair Plant in Baranovichi, 2003. Prototype of modernization. Later number was changed to black. Drawing accuracy: OK.
Two of the few MiGs-29BM, Belarus 2006, Baranovichi. In 2005 eight aircraft gets new camouflage: 01 02 03 04 06 07 65(UB) 66(UB). On the basic two-tone grey-green camouflage were sprayed two green enamels. On each aircraft pattern is different (#01, #02, #03, #04, #06, #07). On #03 light blue was used to cover diminution of enamels on fins, so 5-tone camouflage was created. Prototype #05 remain in basic two-tone camouflage. 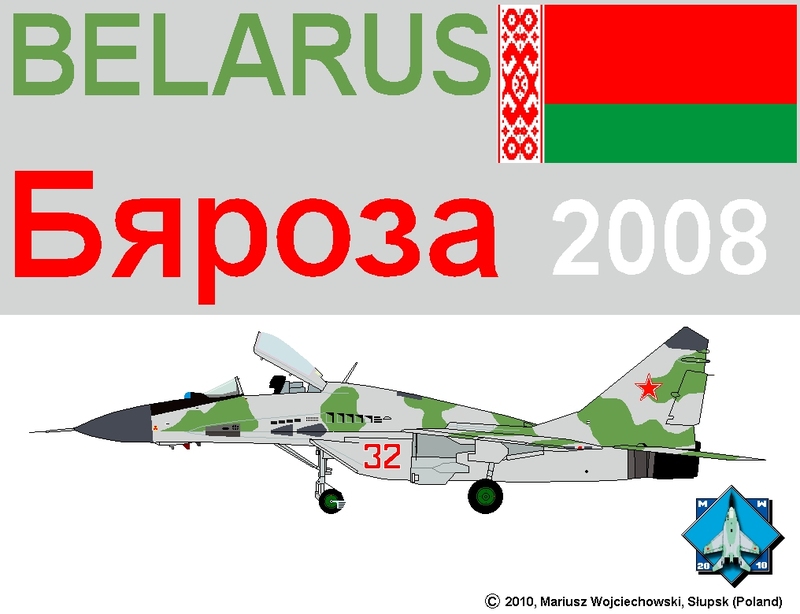 Drawing accuracy: OK.
Belarusian recognition mark since Soviet times was the red star, finally in June 2009 replaced by folded national flag in red and green (on fins; on wings still remains a stars), painted on Sukhois (Su-27, Su-24) and MiGs-29 as well. MiG-29, Belarus 2010, Baranovichi air base. Basically in Baranovichi the two-tone grey-green camouflage is applied on all aircraft (except MiGs-29BM), of course sometimes "improved" during current maintenance. Colours are relatively pale. Numbers are black without outlines. Here's the aircraft with regiment's emblem for '2010 Victory Day parade (as #24, #26, #62UB) and old IFF antennas near KOLS. Drawing accuracy: OK.
MiG-29: MiG-29BM (Baranovichi): 01 02 03 04 05 06 07 and maybe 08. MiG-29, Belarus 2010, Byaroza air base. Two-tone grey-green camouflage is in use in 927th Air Base in Byaroza, in 2008 on aircraft (9-13 or 9-51): #26, #28, #31, #32, #62(UB). Pattern is different on each. Some still wear very dilapidated old MiG's standard camouflage: #43, #46, #49, #50, #52, #63(UB). Numbers are red with white outlines. Drawing accuracy: OK. In August 2010 927th Fighter Air Base was incorporated into 61st Fighter Air Base. In sun-faded colours were so many additional shapes in grey, darkgrey (or both) that camouflage changed to multicolour! Aircraft #41 background colour is light sand. 2014: aircraft #61 (MiG-29UB, produced 1985) ended its service as monumental in Baranovichi. MiG-29UB #67 was overhauled in 2014 in 558th Factory (it was its third overhaul, after 1995 and 2007!!!). Next nine aircraft until December 2015: 11 14 45 46 47 48 49 54 64(UB). It's only overhaul (second), without modernization to BM standard. MiG-29 after overhaul in 2015. Camouflage is similar on ten overhauled MiGs, but slightly different on each. Drawing is little hipothetical between fins.